The Santa Barbara County Sheriff’s Office encourages you to come to California Pizza Kitchen (CPK) at Paseo Nuevo for dinner tomorrow night, December 5, 2018, and help raise money for a great cause. From 4:00 p.m. to 10:00 p.m. the public is invited to come to CPK located at 719 Paseo Nuevo in Santa Barbara, order dinner and be served by volunteer waiters and waitresses from the Santa Barbara County Sheriff’s Office, the Santa Barbara Police Department and the California Highway Patrol. 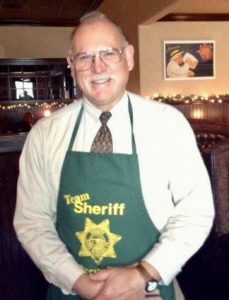 Sheriff Bill Brown will act as Maître d’ and will greet and seat guests. All the tips earned by the volunteer servers will go directly to benefit Santa Barbara County Special Olympics. We appreciate California Pizza Kitchen for hosting us for this special event. We appreciate in advance your attendance and support of Special Olympics in Santa Barbara County. Thanks to Lt. Butch Arnoldi for helping to coordinate our Tip-A-Cop events the past 36 years!